1 Year Warranty with 1 Year IN-HOME SERVICE where possible. Every sauna we produce is tested and inspected by our sauna specialist to guarantee to best quality. Also, we are the only sauna brand that offers 1 Year In-Home Warranty Service where possible. Relax to your favorite music with our premium AM/FM CD Player with USB. The CD player is installed inside the sauna for easy access and includes a remote control so you don't have to leave your seat to change the radio station. Common brands are Phillips, JVC, Pioneer and Teac depending on the availability during production. Tempered glass is four to five times stronger than standard glass and does not break into sharp shards when it fails. Tempered glass is manufactured through a process of extreme heating and rapid cooling, making it harder than normal glass. Decorate With Daria, Inc. is an authorized broker/dealer for Crystal saunas and all sauna orders go directly to our Crystal Sauna distributor in California, who in turn fills your order and handles ALL the customer service and warranty issues. In order to get you the best possible price and the newest models, all sauna stock is warehoused with our Crystal Sauna distributor and shipped to you directly from our distributor. There will times when stock availability on some sauna models may be back-ordered. Crystal Sauna warrants its products to be free of defects in material and workmanship. A retail purchaser of a sauna or parts from a Crystal Sauna authorized wholesaler. However, in the event of a sale, transfer or conveyance of a sauna or parts from any of the three (3) proceeding persons or entities, any rights, duties and obligations associated with this warranty shall be null and void and of no further force and effect. The sauna or parts must be purchased and used within one year of the manufactured date. The sauna or parts must be placed in an indoor environment unless the sauna or parts are specifically designed for outdoor use. If an indoor sauna or parts are placed in an outdoor environment, warranty shall be null and void and of no further force and effect. The controls, heaters, electrical parts and wiring must be kept dry at all times and not exposed to any water or liquids. Indoor Models Parts: 1 Year warranty on wood, controls and heaters. CD player warranty is limited to one (1) year. Includes 1 Year In-Home Service where possible. Indoor Models Parts: One (1) year warranty on wood, controls and heaters. CD player warranty is limited to six (6) months. The warranty begins on the original date of purchase, and is valid only on products purchased and used in the United States or Canada. To receive warranty service, the purchaser must contact Crystal Sauna for problem determination and service procedures. Warranty service can only be performed by a Crystal Sauna authorized service center. The original dated bill of sale must be presented upon request as proof of purchase to Crystal Sauna or Crystal Sauna authorized service center. In-home service will be provided during the warranty labor period subject to availability within the contiguous United States or Canada. In-home service is not available in all areas. To receive in-home service, the product must be unobstructed and accessible from floor level to service personnel. If during in-home service repair cannot be completed, it may be necessary to remove, repair and return the product. If in-home service is unavailable, Crystal Sauna may elect, at our option, to provide for transportation of our choice to and from a Crystal Sauna authorized service center. Otherwise, transportation to and from the Crystal Sauna authorized service center is the responsibility of the purchaser. This warranty covers manufacturing defects in materials and workmanship encountered in normal use of this product, and shall not apply to the following, including, but not limited to: damage which occurs in shipment; delivery and installation; applications and uses for which this product was not intended; altered product or serial numbers; cosmetic damage or exterior finish; accidents, abuse, neglect, fire, water, lightning or other acts of nature; use of products, equipment, systems, utilities, services, parts, supplies, accessories, applications, installations, repairs, external plumbing and leaks, external wiring, circuit breakers, fuses or connectors not supplied and authorized by Crystal Sauna, or which damage this product or result in service problems; incorrect electrical line voltage, fluctuations, and surges; customer adjustments and failure to follow operating instructions, cleaning, maintenance and environmental instructions that are covered and prescribed in the instruction book; consumable items including light bulbs. Crystal Sauna shall not be liable for the loss of use of the sauna or other incidental or consequential damages. Under no circumstances shall Crystal Sauna or any of its representatives be held liable for injury to any persons or damages to any properties. Specifications are subject to change without notice. 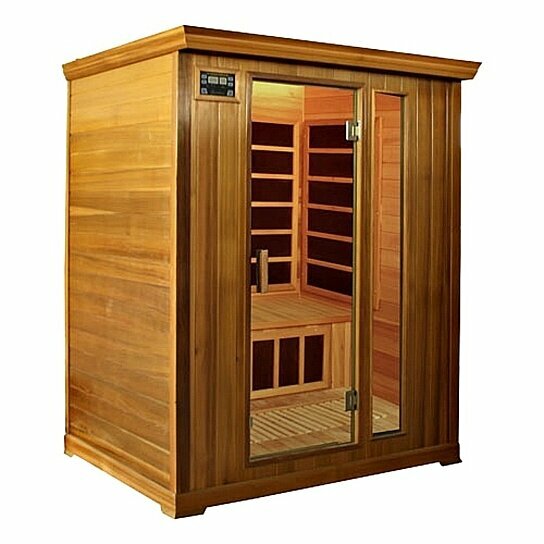 Crystal Sauna uses the highest quality wood in our product lines. All structures using wood are susceptible to minor dents, scratches and scuffing. This is normal and will not affect the integrity or operation of your sauna. Wood is a living material that continues to respond to climate conditions, even after being manufactured into a sauna. Variations in the color or grain, and irregularities such fine cracks are part of the natural beauty of the wood and in no way should be considered defects. During normal operation, wood may crack slightly due to the changes in moisture level. This will not affect the structural integrity of the sauna. Prior to shipping, the wood is inspected for consistency, color and quality. Our saunas are shipped around the globe, and can experience slight blemishes, scratches or scuffs in transit. In most cases, these blemishes on the exterior of the sauna can be concealed by using a small amount of furniture polish, oil or other furniture treatment. The interior blemishes, scratches, or scuffs can be either left alone, sanded or combination of gluing plus sanding. Please avoid any treatment containing benzene or a high concentration of alcohol. ATTENTION: Shipping damage must be notated on the Bill of Lading (BOL). Crystal Sauna must be notified of any damage to your sauna within three (3) business days of signing the BOL. Failure to notify Crystal Sauna within the established time frame will result in the owner taking full responsibility for cost of ALL REPLACEMENT PARTS including shipping and handling fees. THERE ARE NO EXPRESS WARRANTIES OTHER THAN THOSE LISTED AND DESCRIBED ABOVE, AND NO WARRANTIES WHETHER EXPRESS OR IMPLIED, INCLUDING, BUT NOT LIMITED TO, ANY IMPLIED WARRANTIES OR MERCHANTABILITY OR FITNESS FOR A PARTICULAR PURPOSE, SHALL APPLY AFTER THE EXPRESS WARRANTY PERIODS STATED ABOVE, AND NO OTHER EXPRESS WARRANTY OR GUARANTY GIVEN BY ANY PERSON, FIRM OR CORPORATION WITH RESPECT TO THIS PRODUCT SHALL BE BINDING ON CRYSTAL SAUNA. CRYSTAL SAUNA SHALL NOT BE LIABLE FOR LOSS OF REVENUE OR PROFITS, FAILURE TO REALIZE SAVINGS OR OTHER BENEFITS, OR ANY OTHER SPECIAL, INCIDENTAL OR CONSEQUENTIAL DAMAGES CAUSED BY THE USE, MISUSE OR INABILITY TO USE THIS PRODUCT. REGARDLESS OF THE LEGAL THEORY ON WHICH THE CLAIM IS BASED, AND EVEN IF CRYSTAL SAUNA HAS BEEN ADVISED OF THE POSSIBILITY OF SUCH DAMAGES. NOR SHALL RECOVERY OF ANY KIND AGAINST CRYSTAL SAUNA BE GREATER IN AMOUNT THAN THE PURCHASE PRICE OF THE PRODUCT SOLD BY CRYSTAL SAUNA AND CAUSING THE ALLEGED DAMAGE. WITHOUT LIMITING THE FOREGOING, PURCHASER ASSUMES ALL RISK AND LIABILITY FOR LOSS, DAMAGE OR INJURY TO PURCHASER AND PURCHASER'S PROPERTY AND TO OTHERS AND THEIR PROPERTY ARISING OUT OF THE USE, MISUSE OR INABILITY TO USE THIS PRODUCT SOLD BY CRYSTAL SAUNA NOT CAUSED DIRECTLY BY THE NEGLIGENCE OF CRYSTAL SAUNA. THIS LIMITED WARRANTY SHALL NOT EXTEND TO ANYONE OTHER THAN THE ORIGINAL PURCHASER OF THIS PRODUCT, IS NONTRANSFERABLE AND STATES YOUR EXCLUSIVE REMEDY. Some states do not allow limitations on how long an implied warranty lasts, or the exclusion or limitation of incidental or consequential damages, so the above limitations or exclusions may not apply to you. This warranty gives you specific legal rights, and you may also have other rights, which vary from state to state. FREE SHIPPING TO ALL 48 STATES. Sorry, NO PO Boxes or APO's - Our FREE Shipping Policy does NOT apply to ALASKA, HAWAII, PR and USVI CUSTOMERS. Please email us FIRST before buying for the appropriate shipping rate. CANADA RATES are strictly on quote basis - Canadian customers MAY pay up to 15% duty plus Canadian Customs/Brokerage Duty charges when item arrives. WARRANTY - All items (except bedding items) will have a manufacturers warranty policy and return/repair instructions to that manufacturer/distributor. All warranty issues and customer service must be directed to such manufacturer/distributor by the customer. Decorate With Daria is not responsible for such warranty/customer service issues and shall be held harmless in all cases. Decorate With Daria, Inc. does not service any warranties and is not responsible for the customer service of any warranted item. However, we will provide you with the contact information of the manufacturer and warranty procedure and assist you with the warranty process whenever needed . Most items if used for commercial purposes shall void the warranty, please read the items warranty for any exceptions.